Not quite a zen book but zennish enough and more than bookish enough to warrant you knowing about it. 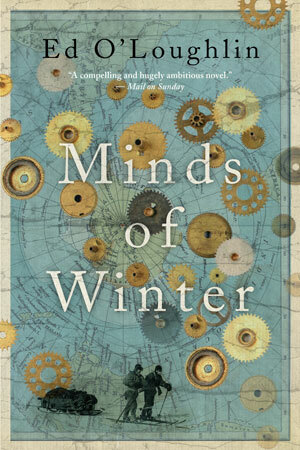 Minds of Winter by Ed O’Loughlin, shortlisted for the Scotiabank Giller Prize, is a book best read with a dance card, playlist, genealogy, time tracker or any variety of two- or three-dimensional process that keeps the characters and events under some control. You may also choose to read it free-form, though that may require copious amounts caffeine and significant restraint against tossing it against the wall. It’s a good book; it is likely a great book. It might take the Giller home – or not. But it takes a discipline that is belied by the back matter on the cover. A mystery across time and culture, it promises a riddle about the chronometer from the Franklin Expedition that one assumes will be solved; historical events uncovered and put in place; and, characters who risk all just for the enjoyment of doing so. O’Loughlin’s vision of the scope of this topic is formidable and where it lacks – frustratingly – in depth, it does console with terrific prose. What may be unforgivable, depending on the level of sustain attention training the reader has, is his compulsive need to throw in everything, and the kitchen sink. I picked up the book because a kitchen sink played a role in my own connection with the Franklin Expedition. As an archeological chemist in a previous career incarnation, I was given a container filled with frozen tin cans, dripping across the lab floor. They were hypothesized to be from the Franklin Expedition and for months the excitement in the labs was electric. Franklin’s passage, disappearance, and the eventual (best possible) resolution is the stuff of many careers and romantic speculation. O’Loughlin begins with a speculation and fantasy of his personal life and his ambitions. There is little to foretell the chronometer. In fact, there is little substantive thread to follow about this chronometer. Its appearance is ghostly and, moving across the words on the page, one might almost wonder if it was imagined. Many a sentence is re-read to verify these fleeting sightings. I suppose this would be exciting enough, to feel the search as an embodied experience, but a purely experiential flow makes for better meditation than fiction. Thankfully, the characters enlisted by O’Loughlin are fascinating in themselves. Some are historic and therefore verifiable. Others are purely fictitious and therefore need some level of plausible accreditation. O’Loughlin doesn’t offer any of that for these latter creatures, leaving them to our imagination but also untethered in the minds of the narrative (there is more than one). To fully engaged with Minds of Winter, it is necessary to approach it as a 20th century telling of the 1001 Arabian Nights. Set the intention to simply meet each character and event without any attachment to the storyline or its promised outcome. In fact, it’s more a koan about desire, aversion, stuckness, and surrender than a riddle about a timepiece. Renounce all pre-occupations to know the who, what, when, where, and why of this theme. Perhaps the only value to be found here is a love of powerful language (at times), evocative imagery (at times), and a chilling confrontation with our desperate need to know fully (always). Will it take the Giller? Perhaps. I suspect however the other books with a closer-to-bone narrative might leave it still thawing in the permafrost.